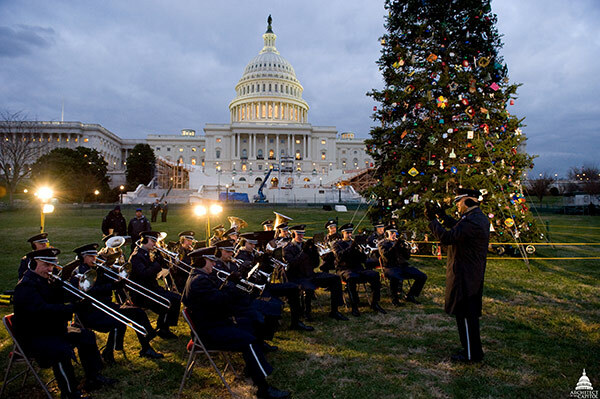 The regular practice of displaying a Christmas tree on the U.S. Capitol grounds is relatively recent. Records at the Architect of the Capitol (AOC) show correspondence from 1919 indicate that a Christmas tree was purchased that year. However, it was not until 1964 that a definite procedure was initiated and a tree-lighting ceremony established. 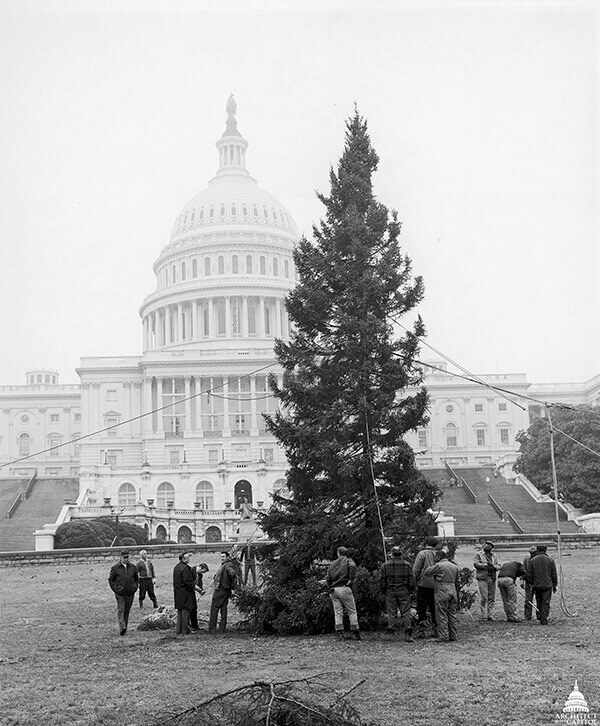 In 1964, House Speaker John W. McCormack suggested to J. George Stewart, Architect of the Capitol, that a Christmas tree be placed on the U.S. Capitol grounds. A live 24-foot Douglas fir was purchased for $700 from Buddies Nurseries of Birdsboro, Pennsylvania, and was planted on the West Front lawn. Each year through 1967 this tree was decorated and a tree-lighting ceremony was held. Unfortunately, a combination of factors, including a severe wind storm in the spring of 1967 and root damage, caused the tree to die in 1968; it was removed in the same year. The 1968 Christmas tree was made from two white pines from Finksburg, Maryland, and was 30 feet tall; the 1969 tree was a 40-foot white pine from Westminster, Maryland. The United States Department of Agriculture Forest Service has provided the trees since 1970. 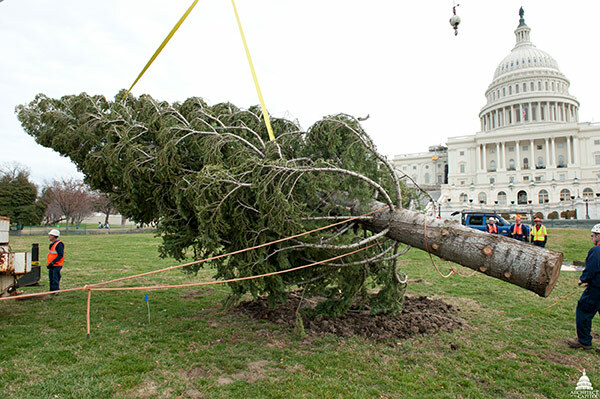 AOC Capitol Grounds prepares to place the 2011 Christmas tree on the West Lawn. Preparing the Christmas tree is a true team effort for the AOC. We work around the clock from tree selection to arrival, decoration and lighting. Information about individual trees is listed below. Height is provided as measured in the forest by the National Forest Service. Band playing during the 2008 Christmas tree lighting ceremony. AOC workers anchor the 1971 Capitol Christmas Tree, a Black Spruce from New Hampshire's White Mountain National Forest. 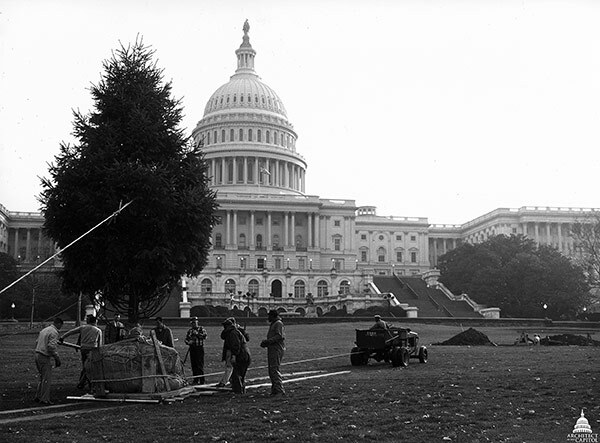 The first Capitol Christmas Tree being planted on the West Front in 1964.